First off, I am the type of person who finds myself singing Weird Al lyrics instead of the real ones whenever popular songs come on. I welcome anyone who shares this affliction, as I’m sure you were just as excited when his new parody “Tacky” (of Pharrell’s “Happy”) came out this week. It’s a fantastic song, and quite a few of the lyrics actually deal with modern etiquette faux pases. I did not know all this, but when I was a kid, I always thought tacky was somehow related to the concept of “tact,” which is really the sensitivity in which one deals with things outside of themselves. I thought a “tacky” person was one with no tact, no concept of how their actions were being perceived or reacted to by others. In short, I thought it had to do with rudeness. Obviously, these two are different concepts, but sometimes I do think they’re still related. So, which things in “Tacky” are actually rude and which are just a matter of taste? We figured you may want to know, which is why we will now go LINE BY LINE THROUGH THE NEW WEIRD AL SONG and parse out the social implications. You’re welcome. It might seem crazy, wearing stripes and plaid – Crazy, yes, but power clashing is never considered a matter of etiquette. I Instagram every meal I’ve had – Definitely rude. If you want to take a meal photo now and then, fine, but you should err on the side of sparing your guests a display of your artistic meal positioning skills. Plus, your food is getting cold. All my used liquor bottles are on display – Not rude, but definitely makes your house look like my ex-boyfriend’s sophomore year dorm room, which is not a good look for anyone. We can go to see a show but I’ll make you pay – It’s unclear how Weird intends this line. Does this mean you’ll spend the whole show tweeting? Talking? Were you invited to a show under the impression that it was a treat, but last minute were told you had to pay for your own ticket? I mean, all of these things are bad, but in varying degrees. Wear my belt with suspenders and sandals with my socks – Not rude, especially if you’re a dad. Got some new glitter uggs and lovely pink sequined crocs -Again, fashion is not rude, unless you’re wearing this getup to a funeral. Never let you forget some favor I did for you – Definitely rude. A favor is a favor, and should not be held over the recipients head for the rest of their lives. 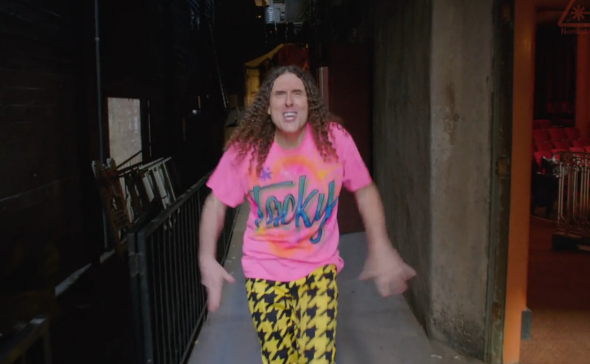 I meet some chick, ask her this and that – Derogatory terms for women are always rude, WEIRD AL. Like are you pregnant girl, or just really Fat? (What?) – Inquiring into the reproductive state of any person is always rude, as we have discussed. Well, now I’m dropping names almost constantly – Not necessarily rude, but I do think this falls under tactlessness. Think it’s fun threatening waiters with a bad Yelp review – Incredibly rude! Most of the time, bad restaurant service is the cause of a number of factors, not just the waiter’s negligence. And threatening employees is basically the best way to get thrown out of a restaurant, not get good service. [Bridge] – Nothing in the bridge deals with tackiness or rudeness. 43 Bumper Stickers and a “YOLO” license plate – I don’t know what Weird Al is talking about, this person sounds pretty cool. Bring along my coupon book whenever I’m on a date – Frugality is certainly not rude, and if your date tries to shame you they can go ahead and pay full price themselves. That being said, learn which things are worth springing for. Practice my twerking moves in line at the DMV – Totally rude. You are to stay still and quiet while waiting on line. Anything else gets death stares. Took the whole bowl of restaurant mints. Hey, it said they’re free – On one hand, they’re free, go ahead. On the other, it’s only polite to make sure everyone has the opportunity for fresh breath. And take off my shirt, at least – I’m pretty sure most banks have a “No Shirt, No Shoes, No Service” policy, to say nothing of public intoxication, so this may no be rude so much as it is illegal. I would live-tweet a funeral, take selfies with the deceased – PEOPLE DO THIS. DON’T DO THIS. If I’m bitten by a zombie, I’m probably not telling you – Well duh, you’re a zombie now, you can’t talk.